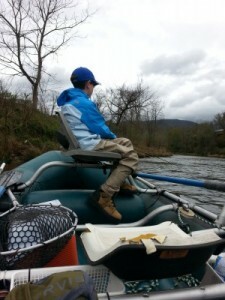 The weather has been great the past few weeks for Tuckasegee River Delayed Harvest trout fishing! Below are few details from last week as we launched as soon as the light rains let up for a day of guided float fishing for trout. The Black Caddis and a few March Browns were coming off steady till about noon. We did best swinging attractor wets as the fish were up with many rising on the surface to feed. The activity let up on the surface and they went back down deeper as the approaching cold front blew in about 2:00. We nymph fished a while using #14 Pheasant Tail Nymphs and a few other flashy nymphs due to the off colored water. It stayed very dark all day out there with cloud cover. Started the day in the rain brushing up with some casting to get the folks looking good reaching the water they wanted to fish. A brief study of setting the hook and playing the fish was the final topics before launching the raft. This helps the day to run smoothly on the water and the folks did great! In the picture above, we had seen fish activity along the bank as the water came up so we anchored up the raft and fished off the bank before lunch. Sectioning off water pays off with a river this size when nymph fishing. With colored water and low light fish cannot see as well so it pays to rapidly cover the various sections of water thoroughly with a robotic-like cast that pepper the water all over. When the winds blew in from the north you could tell it right away with the fishing. 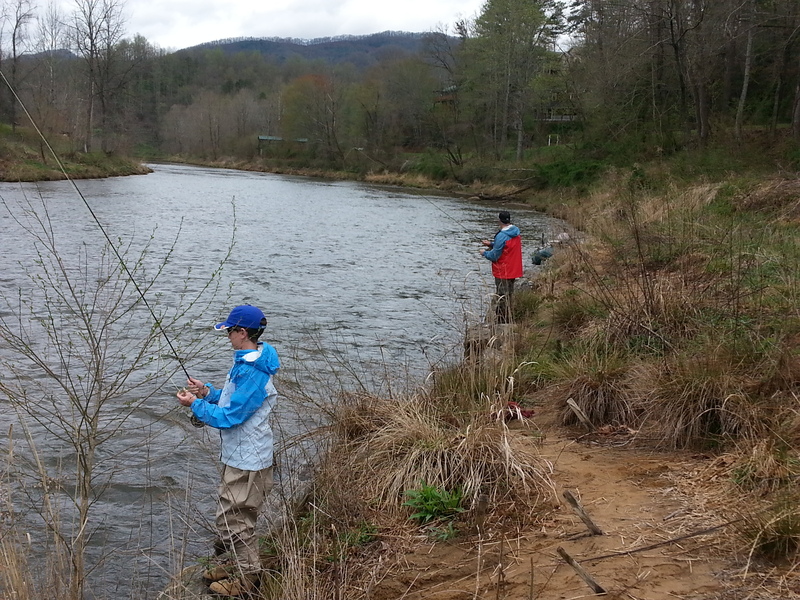 That is typical for fish behavior with an approaching cold front in that the fishing slowed way down later in the day. Looking forward to floating the weekend out there. Should be a great weekend out there with the weather and hopefully more hungry trout. Jon Dietz, Team USA Youth member will rack up some serious numbers out there in the morning!